Dan Shiffman isn't like most professors. Instead of Scantron sheets and bluebooks, Shiffman prefers to give his final exams on a 120-foot video wall that's the equivalent of six 16:9 displays linked end-to-end. Yes, it is final exam time for Shiffman's Big Screens Class-at 6PM on a Friday night, with free wine-and I am standing with a couple hundred other likeminded art techies in the lobby of the IAC Building, a curvy glass Frank Gehry creation on the West Side of Manhattan. We are in front of a 120-foot screen that's the equivalent of six 16:9 displays arranged end-to-end, and we are doing what it's telling us to do. We are obeying it. It tells us to clap, and we clap. Then we stomp our feet and say "la la la." Then we send text messages to it, filled with the anticipation of influencing what appears on its glowing greatness. We clap to shoo white birds off a power line that's strung across its great length. We do it while drinking and taking pictures of the action, and it is good-a techie church for bigger screens, always bigger! We kneel! For the Big Screens class, the wall is powered by three dual-head Mac Pros, each driving their own pair of 16:9 aspect-ratio screens (splitting nine projectors for each head), for a total resolution of 8160 x 768 pixels. The class is part of of NYU's Interactive Telecommunications Program (ITP), a two-year graduate degree they've offered since 1979 and the source of all kinds of geeky curiosities. Shiffman, a wizard of the graphical programming language called Processing that many of the students use to fill up the screen (a few others use openFrameworks, another visual language) has taught this class for two years now. Processing has been used in tons of music videos, data visualizations and interactive video art and is popular for its relative simplicity as a way to turn code into amazing visuals. Talking to the students, it's apparent that such a unique medium can barely be classified as a "screen" in the traditional sense. The immense size, when paired with such an extreme aspect ratio, turns the screen into more of a physical space than anything resembling a TV (even one that's 150-inches). Besides, it's not about resolution, in the home-theater sense. Sure, you can do a lot with 6 million pixels, but it's not why you come to see this 120-foot screen. Shiffman works the controls at the back of the room with a gigantic smile; he is perhaps the only person that could teach this class. He's the primary author of the "Most Pixels Ever" library for Processing, which allows projects to sync up across multiple displays seamlessly without delays-and not just your dual-head monitor. 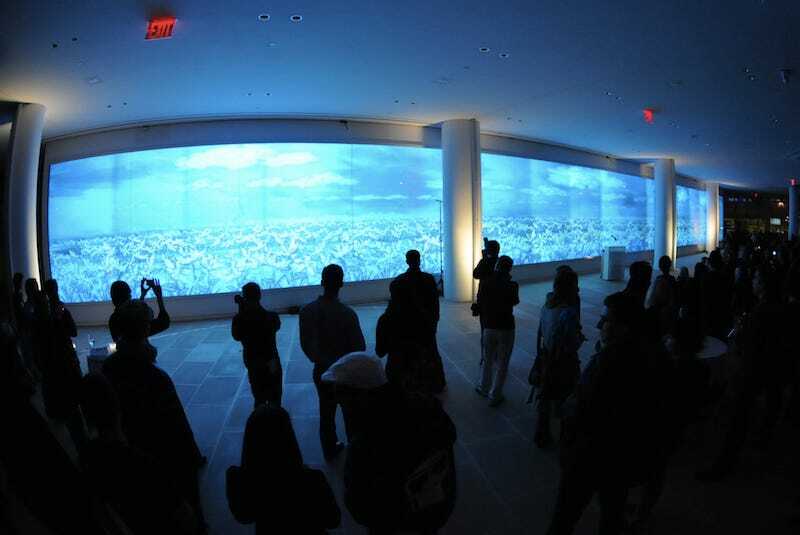 Most Pixels Ever is amazing because it can handle the 6 million pixels of IAC's video wall without blinking, and without it, this class would not exist in its current form. All the art-tech nerds thank him as we file out the door. "For the students it's just such a completely unique experience-it's unique for anybody, whether you're a grad student or a professional designer. Few people in the world have a chance to work on anything of this scale, and what's great is that I can say to them you can do whatever you want," he says. "You learn a ton about technically producing the work, and also what it means visually to work on that scale." "I can't imagine that when IAC build that wall that they imagined performances on it with actors casting shadows behind the screen, so that's fantastic."